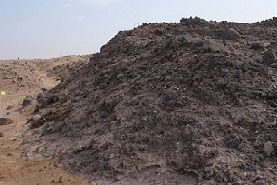 Military fortification in Sabah Al Ahmed natural reserve adversely affected plant growth and soil functioning.163 Well head pits containing oil sludge & oil contaminated soil 19 of which could potentially contaminate potable ground water of Al - Raudhatain and Umm Al Aish.271 km2 of Tarcrete covered areas which impaired ecological process. 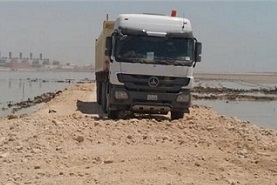 Damage to more than 1000 km2 of desert surface from military activities causing damage to desert, soils and vegetation leading to increased wind erosion and sand mobilization. 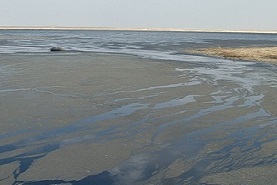 Wet and dry oil lakes formed by discharge of oil from damaged well heads, flow of oil spills and ruptured pipelines resulting in contamination of about 114 km2 of desert surface. 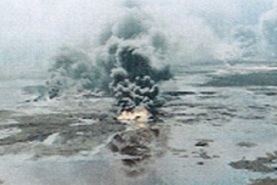 To treat and remediate the Contaminated ground water within the only two fresh water aquifers in North Kuwait namely Raudhatain & Umm Al Aish as a result of Iraq’s invasion and occupation of Kuwait due to infiltration of see water used to fight oil well fires, contamination from oil recovery pits , oil lakes and leakage from damage oil well heads.